Jetstar is to begin three times weekly direct flights between Adelaide and the Sunshine Coast from September 30, the Qantas-owned low-cost carrier announced on Friday. The new flights will operate with 180-seat Airbus A320s on Wednesdays, Fridays and Sundays, and add a further 56,000 seats a year into the Sunshine Coast market. 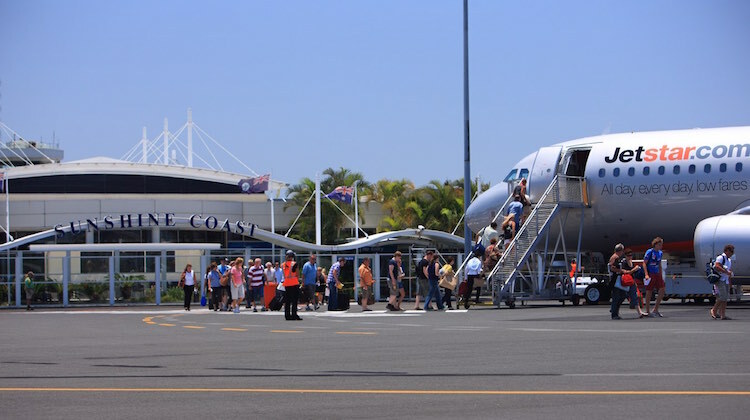 “Our strategy has been to diversify our market base as widely as possible, and the start of direct Jetstar services from Adelaide complements significant growth in direct services from Sydney, Melbourne and across the Tasman,” Visit Sunshine Coast acting CEO Simon Latchford said in a statement. Perhaps someone could have a serious look at Canberra – Maroochy hello Jetgo…. Jetstar’s $69 sale fares on this route are $50 more for a return flight than if you flew BNE-ADL with the current Tigerair sale. Its awesome to see a new destination at sunshine coast!!!!! Inherentchoice with the abysmal traffic holdups on the Bruce Hwy there is no guarantee you will connect with your flight unless you sleep in Brisbane overnight. We have missed flights when we left plenty of time. Connecting two places with nothing to do. I’ll give it 6 months. Good to see, let’s hope more regional centres get joined by direct flights so we can all avoid the 2 stop via Brisbane or Sydney to get anywhere in this country. The govt should open up the skies to all airlines if the Australian carriers don’t offer services, use it or lose it. It’s good news to be getting more flights but it’s the wrong way! We who live on the Sunshine Coast want to travel North to Cairns etc. Jetstar should have flights to Cairns, Townsville, Mackay, FIJI, Vanuatu, Bali along with the current SYD and MEL and maybe a 787 to Singapore but that rout is better suited to Qantas. Virgin Australia don’t seem to care about growth here on the Sunshine Coast so I’m not even going to bother with them. Also I’d like to put a suggestion forward to readers. With the new runway being built (runway 13/31) 2450m x 45m (Code E) be lengthened from the South East to make it a 2700m+ runway and have a parallel taxi way? All they would have to do is resume house and bull doze them etc. Also they could build a new terminal for 4-5 787/777 aircraft and 8-10 737 aircraft at one time all with air bridges. Also they could build ramps for 747-8 aircraft or additional aircraft for example 777s for when Brisbane is closed due to weather. From my understand there is the room to build it. Also note that the Sc airport is an alternative for the RAAF Base Amberley if it was closed for some reason. GC is closing in on 700,000 people, and rising fast, and also serves northern NSW approx another 100,000, so there’s almost 3 times the population base than SC in a smaller area. Here, like the Gold Coast there are a lot of retirees and family’s that travel and not all go to Sydney and Melbourne…..
Actually this is not a new route its a resumption. Jetstar operated it when they started out in 2005-06 using the 717s. I still have the old route map somewhere showing it.